The wainscoting added lightness and brightness. I replaced the ceiling fan/light with just a ceiling fan and installed recessed lighting and sconces on dimmers to provide softer, controllable light. It was difficult finding bedding that I liked. So, I went custom. I made the duvet cover, pillows and window treatments. Good interior design bedrooms include a great headboard that makes the bed the focal point. This client had always dreamed of having a headboard. 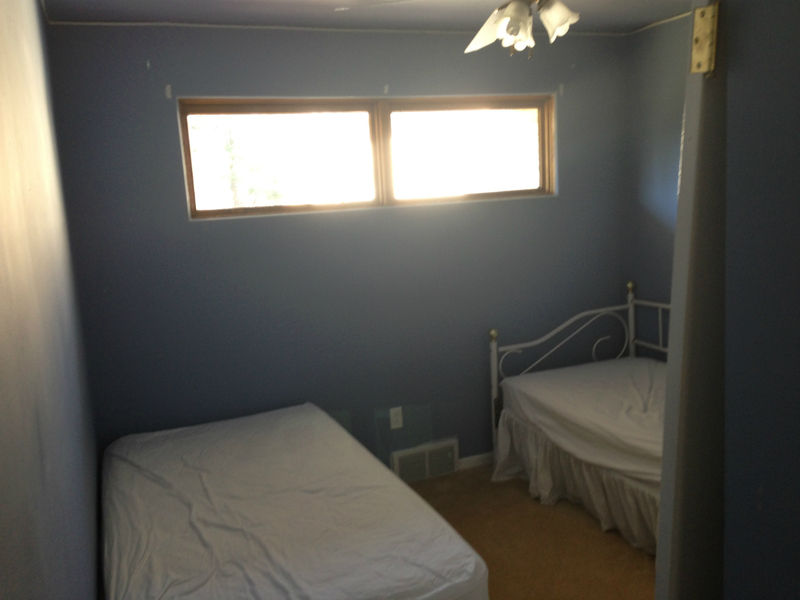 The mid-century style windows made a headboard difficult. 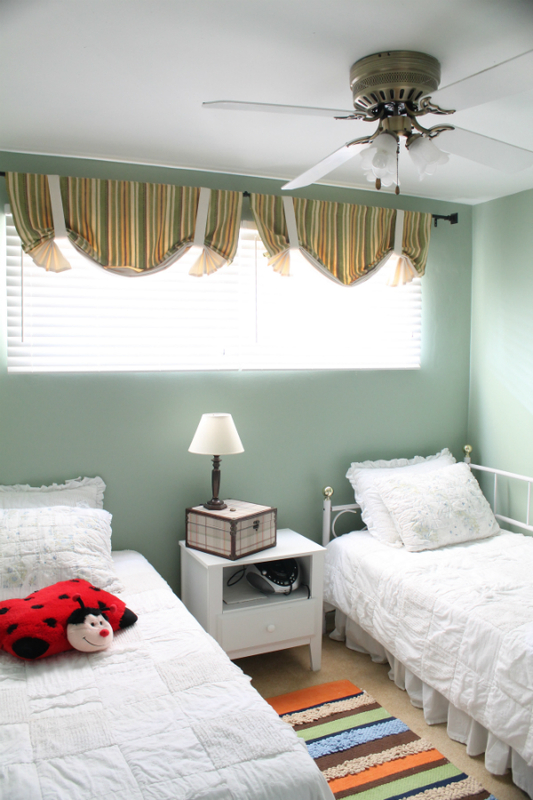 Because of the window’s location, a standard headboard would cut the window in half. To use a smaller headboard would look awkward with the size of the bed. So, I designed a custom headboard that included the window as part of the headboard. I built a wood frame with upholstered panels. The top two panels are hinged so that they can act as shutters. They can be opened or closed to expose or cover the window. I changed the color scheme with paint and accessories. I also created a cornice upholstered in the same fabric as the headboard to pull everything together. The clients were ready to replace their furniture. But it was solid wood and in good condition. I convinced them to let me paint and distress their dresser, chest of drawers and nightstand. 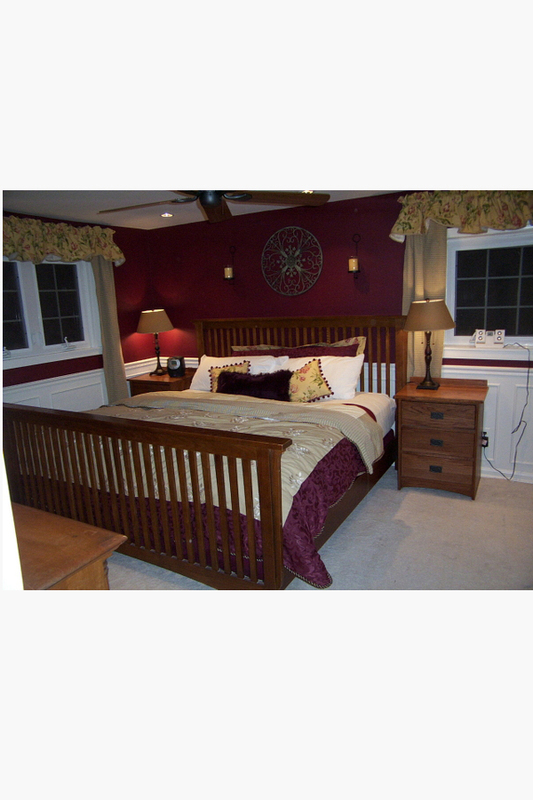 This client wanted to re-do the bedroom interior design of a room that was no longer needed for her daughter. They initially wanted to start from scratch. For my interior design bedroom projects, and all my interior design projects, I’m not one for throwing things away if I can reuse them. 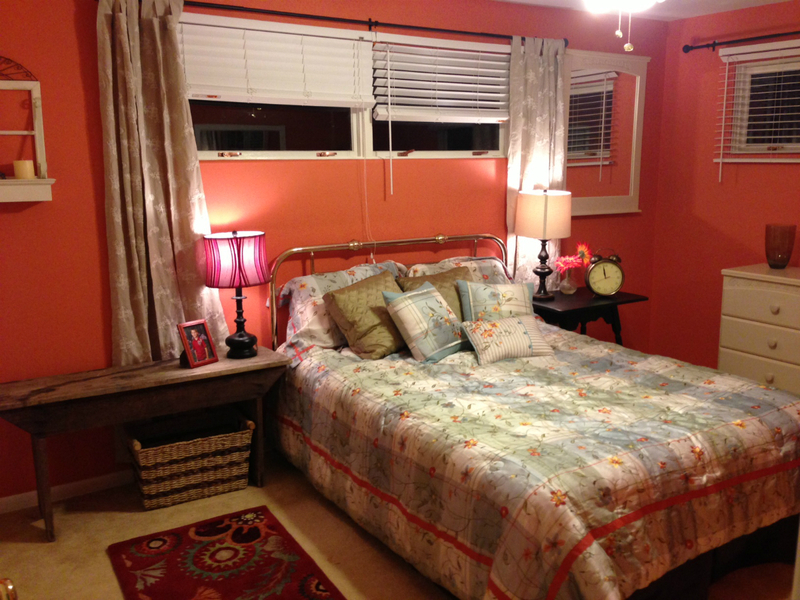 I convinced them to keep the bedding and built the color scheme around the orange line in the bedding. I love incorporating old and new. So I pulled in an antique bench and table as nightstands. This client needed a small bedroom interior design. 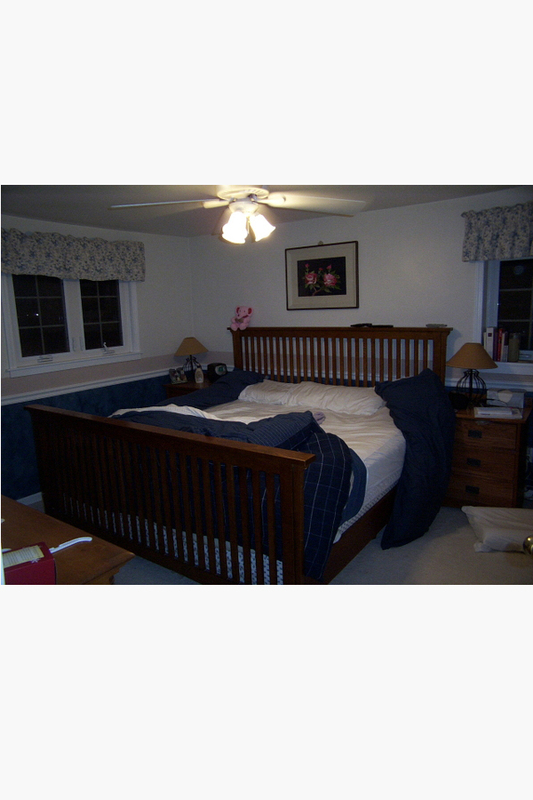 She had a spare bedroom that she typically used for her grandchildren when they stayed over. It needed to be bright and cheery, yet gender neutral since they have both boy and girl grand kids. I changed the color scheme and added some new accessories. The finishing touch was stagecoach valances I made from a $5 tablecloth. 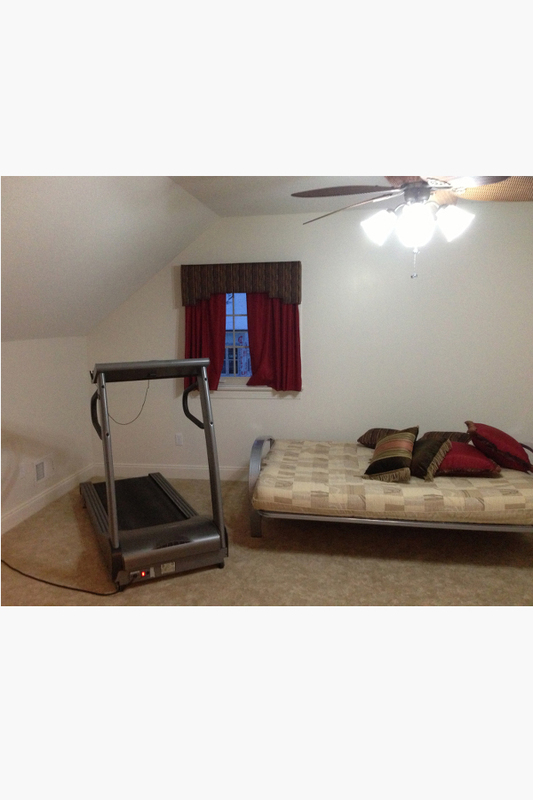 This client had an interior design bedroom project for a guest bedroom that she used as an office and an exercise room. 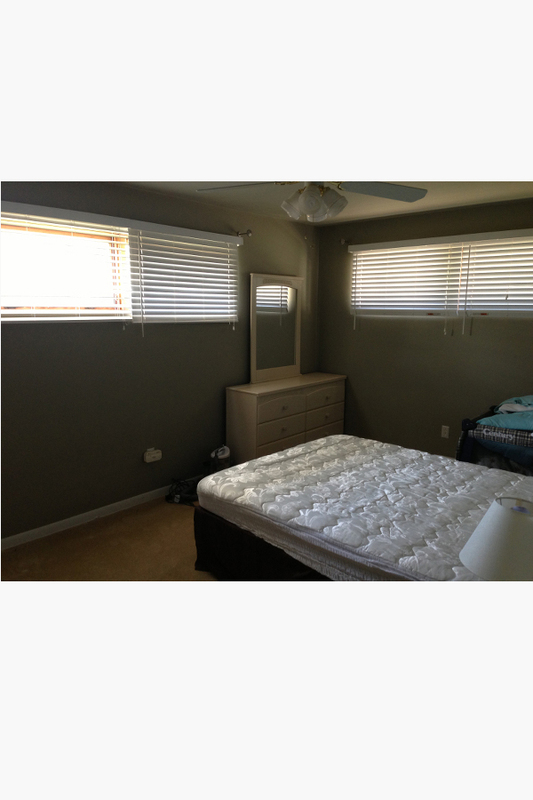 It was a blank slate with off white walls and only the existing window treatment and futon cover giving off a color. We were inspired by a mural we saw in a magazine. I created my own interpretation with layers of pearl and purple glaze. I created a new cornice that carried on the flow of the mural. I also made the futon cover and coordinating pillows to pull everything together. I had originally created a textured gold and charred gold stripe to match the bedding and window treatment in this client’s bedroom interior design. Later I went back to pull everything together. I glazed the walls to mimic the distressed finish of the vanity and customized the ceiling fan and shades with a finish to match the walls. I also reupholstered and refinished the chair to complete this bedroom interior design project.